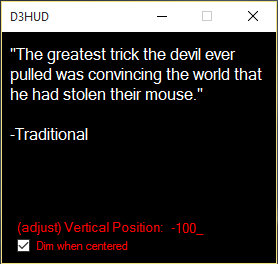 D3HUD.exe is a themed mouse finder for Diablo 3. It draws a sequence of pentagrams between your character and your mouse. There is an option in the gui to adjust the vertical position if it does not center on your monitor. Additionally, you may dim the pentagrams when the mouse approaches the center of the screen. Will only work in windowed fullscreen mode.